When James Baldwin’s The Fire Next Time was first published in 1963, it sent ripples throughout America as one of the most passionate and raw explorations of race relations of its time. Now, more than 50 years later, Baldwin’s book carries fresh relevance, as the United States and much of the Western world continues to struggle with the issue of racial inequality. 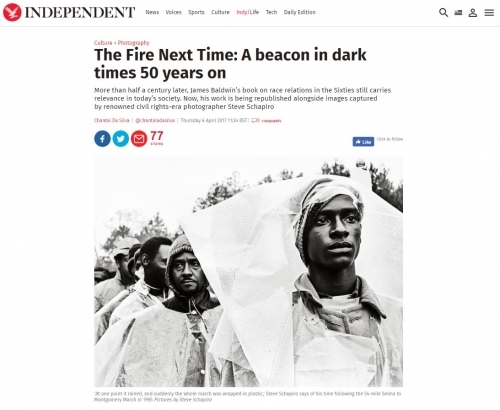 Perhaps that’s why publisher Taschen has decided to reprint Baldwin’s book, with a new edition that will feature stunning images of moments in history captured by civil rights-era photographer Steve Schapiro. Baldwin and Schapiro travelled the American South together for Life magazine in the Sixties – an experience that thrust Schapiro into the centre of the human rights movement and inspired him to dedicate much of his career to activism.